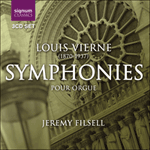 The Sixième Symphonie in B minor Op 59 (1930) is a supremely virtuosic work pointing both to a new musical and technical order and a linguistic development perhaps only truly fulfilled by Vierne's successors (Dupré, Messiaen, Alain). 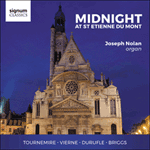 Dedicated to the memory of American virtuoso, Lynwood Farnham (recently deceased in 1930), it was Maurice Duruflé who premiered the work in 1934 at Notre-Dame. Cyclic form again serves Vierne despite a tangibly improvisatory feel to many passages in the symphony. The opening Introduction and Allegro ventures towards the limits of tonality in a highly developed chromatic language, yet its dramatic lines remain strong. The elaborate first theme [A] is heard at the very outset and the mysterious second theme [B] appears in an ultra-chromatic harmonised statement soon after. The dramatic Allegro, which breaks out from it, carries subtle transformations of both themes in as strong and cogent a symphonic fabric as Vierne ever created. Certain imposing chord sequences seem to anticipate the Final, and yet the many rapid, arpeggiated figurations appear to take up where the finale of the Cinquième Symphonie left off. Based on the melodic contours of theme A, the Aria's prevailing mood is hazy and mysterious. A chordal introductory passage interjects between episodes of wide-ranging, arching 'vocal' lines (inverted contours of [B] on the Récit trompette. The final stanzas juxtapose these ideas and the cadence forms a musical 'sunset' of static luminosity. In the brilliant scherzo, theme [A] is clear, later appearing in inverted form. Siegfried Schibli stated that the movement had 'an iridescent quality that sometimes stops little short of the grotesque reflecting Vierne's pronouncement that in the music's bizarre and humoresque rhythms, he had attempted to depict the derisive grin of a gargoyle.' The haunting, brooding Adagio emerges from a long 'pedal point' and evolves into a chromatic labyrinth built from both themes [A] and [B]. Lyrical and expressive, the solemn and static coda is one of exquisite beauty. In strong contrast to the astringency of the four preceding movements, the Finale is an ebullient, joyous and free-spirited tour-de-force. [B] is transformed into a rousing statement of splendour, pomp and even razzamatazz and the movement's unbridled joie-de-vivre has undoubtedly contributed to its reputation as one of Vierne's most popular symphonic finales. After the long, drawn-out tension of the preceding movements' journey, the joyous optimism of this conclusion to the symphony is entirely justified. In Rondo form, the rousing opening theme (transformed theme [B] is spectacularly underpinned by pedal 'timpani'. A new and lyrical 'second subject' infuses the central, contrasted episode and the reprise of the opening music heralds developments of [A] in combination with the movement's second subject in grand statement. The famous cascading pedal scales usher in the brilliant conclusion, ending Vierne's symphonic 'journey' at a point where the elasticity of tonality seemed to have been stretched to breaking point.